Make it a keepsake they will have long after the cheese is gone. Fabulous stone slate cutting board with artisan-made cheeses from around the world including Sartori Basil & Olive Oil Asiago, Beemster Dutch Vlaskaas, and BellaVitano Wisconsin Black Pepper. Each gourmet cheese is paired with savory snacking selections including Tuscan Herb Salami, Flat Out Good Crispbread, and Willamette Valley Stone Ground Mustard. 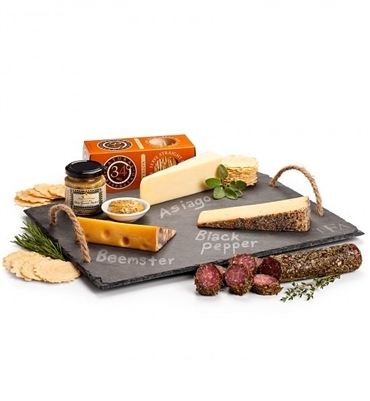 Cheese board is made of natural stone slate, with sturdy rope handles on either side, a velvet mounting to protect delicate surfaces, natural edges and food-safe soapstone chalk for labeling cheeses or welcoming guests. Complimentary monogramming guarantees a long-lasting impression. One Slate Stone Cheese Cutting Board. Sartori Basil and Olive Oil Asiago. 1/4" thick solid stone cheese slate with rope handles, velvet backing, and food-safe chalk. Handwash only. Award-winning Sartori Basil & Olive Oil Asiago, with six months of careful aging, and hand-rubbed to perfection. Sartori is the recipient of Wisconsin State Fair's Silver Medal in 2010 and 2008, and the 2010 World Cheese Awards Bronze Metal. Award-winning Wisconsin Black Pepper BellaVitano: rich, nutty, and creamy. Earned the Gold Medal at the World Cheese Awards in 2009 and First Place prize from the American Cheese Society in 2011 and 2009. Gold-medal winning Beemster Dutch Vlaskaas, with a secret traditional recipe handed down through generations, loved by children and connoisseurs alike for its creamy sweetness. Lactose and gluten free. Bellentani Tuscan Herb Salami: An enduring Italian brand since 1821, made in the USA to exact Italian specifications of traditional curing and quality ingredients. Sturdy rope handles for easy serving and transportation. Specially designed with space for traditional monogramming. Engraving area: 3 initials on corner of slate in traditional monogramming format. Enter information to be engraved using the personalization option during checkout.